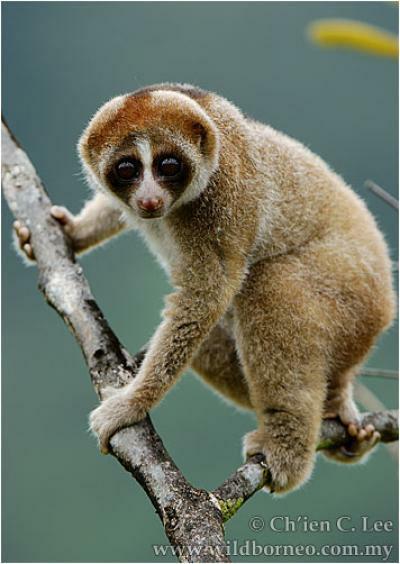 The slow loris (Nycticebus) is a primate genus closely related to the lemur and found across South East Asia, from Bangladesh and China's Yunnan province to the island of Borneo. The slow loris is rare amongst primates for having a toxic bite, and is rated as Vulnerable or Endangered on the IUCN Red List. Maybe not so endangered, since researchers have found a brand new species. A team's analysis of the primate's distinctive facial fur markings, published in the American Journal of Primatology, reveals the existence of one entirely new species, while two possible sub-species are being officially recognized as unique. Slow lorises are recognized by their unique fur coloration on the body and face, yet while traits such as fur patterns are often used to distinguish between species; nocturnal species are cryptic in coloration and have less obvious external differences. The team's research focused on the distinctive colorings of Borneo's slow loris, whose faces have an appearance of a mask, with the eyes being covered by distinct patches and their heads having varying shapes of caps on the top. "Technological advances have improved our knowledge about the diversity of several nocturnal mammals," said Rachel Munds from the University of Missouri Columbia. "Historically many species went unrecognized as they were falsely lumped together as one species. While the number of recognized primate species has doubled in the past 25 years some nocturnal species remain hidden to science." Differences among these facemasks resulted in recognition of four species of Bornean and Philippine lorises, N menagensis, N. bancanus, N. borneanus and N. kayan. Of these Nycticebus kayan is a new group unrecognized before as distinct. This new species is found in the central-east highland area of Borneo and is named for a major river flowing in its region, the Kayan. The recognition of these new species strongly suggests that there is more diversity yet to be discovered in the jungles of Borneo and on the surrounding islands, including the Phillipines. However, much of this territory is threatened by human activity so the possibility that more slow loris species exist in small and fragile ranges raises urgent questions for conservation efforts. "The pet trade is a serious threat for slow lorises in Indonesia, and recognition of these new species raises issues regarding where to release confiscated Bornean slow lorises, as recognition by non-experts can be difficult," said co-author Professor Nekaris, from Oxford Brookes University. "In the first study to quantify facial mask differences we have recognized three new species of slow loris, two of which were recognized as subspecies at some point in the past, but are now elevated to species status, and one previously unrecognized group." concluded Ms Munds. "This finding will assist in conservation efforts for these enigmatic primates, although survey work in Borneo suggests the new species are either very difficult to locate or that their numbers may be quite small."